This week I’ve been gradually recovering from a cold named Colossus. If it were a movie it would be in IMAX 3D. My most special effect is a thundering phlegm-filled cough that strikes fear in every subway rider standing in my soggy, heavy breathing presence. I have wondered what germy New Yorker passed this monster onto me. How I wish I had deflected that pass. I recall my blood running cold when a store clerk suffering stage four sniffles rubbed her nose as she handed me my change. But that was a few weeks before I fell ill. When I returned home from that encounter, I played it safe: I bathed in bleach. My concentration has had lapses. I’m more focused on sneezing, wheezing, hacking and hoping one day my ears will unclog. Then I can once again savor my fellow commuter’s iPod leaking tinny percussive sounds. Sounds played by a small orchestra. Possibly an orchestra comprised of a herd of hamsters bred with minute opposable thumbs that have discovered the triangle. The Head Thought: I don’t know about you guys, but I’m out of here. Apparently, all of my other thoughts followed that charismatic thinker. So I completely blanked on getting cough drops. 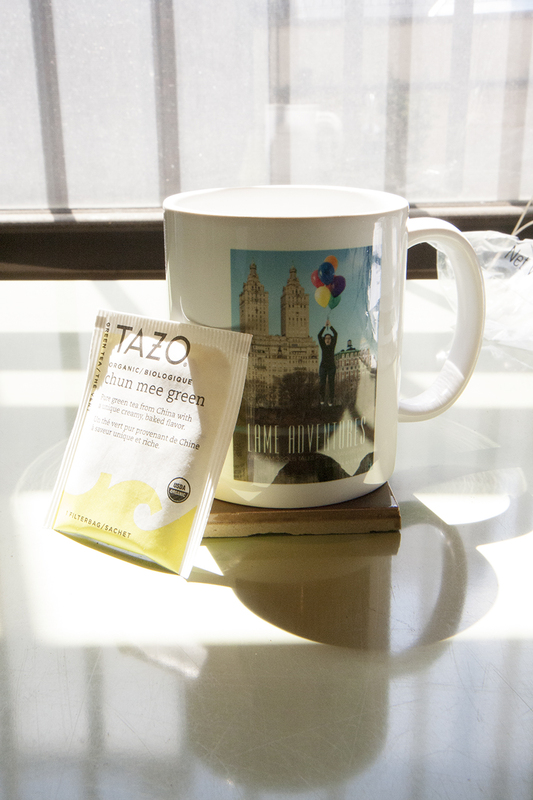 Now thoughtless, I impulsively picked up a box of green tea that has done zilch to silence my cough. The next time I went to the store I repeatedly said to myself “get cough drops” like a mantra. I got the cough drops. I brought them home. I placed them on my table and then my thoughts apparently went on spring break because I forgot to take the cough drops with me when I went out. If there were a medical procedure where I could have a package of cough drops sewn discreetly into my body, if it was covered by my insurance and did not cause too big a bulge, I’d seriously consider it. If there could be room for a pack of tissues and lip balm, better yet. I responded to the email from a House Manager at a theater company who scheduled me to usher an off-Broadway play on May 17th by declaring, “Thank you for scheduling me to usher on March 17th.” That matter has since been resolved. I assured him that “I am on top of my game this 2004 theater season”. I suspect that he is now completely convinced that I’m senile. When I was returning home from doing my laundry last night I saw a fireplace mantle strategically placed over a city trash can on the street corner. I continued walking, certain that my flake-filled head had imagined this. Then, I walked back. Here’s proof that I remain somewhat lucid in my delirium. But maybe not the greatest picture taker while holding a laundry bag. At least I wasn’t coughing. This entry was posted in Humor, new york city, theater and tagged common cold, cough drop, feeling like crap, illness, sick, spring cold, street junk. Bookmark the permalink. I am so sorry to hear that you’ve been so far under the weather as to not even be able to know what the weather has been doing the past few days. The fireplace mantle does add a nice homey touch to whatever corner of the UWS it adorned. Too bad there wasn’t room in your S.S. for such a piece. Here’s to hoping you shake the death rattle soon and you can begin another Lame Adventure to share with us. Speaking of Lame Adventures I sprained an ankle helping a friend do her chores, after surviving my two six-teen hour marathon weekend warrior days back to back with out so much as a splinter. Ironic we must be incapacitated now that the weather has broken. I am sardonic, and bitter. Drink plenty of libation, er… liquids. I once had a sprained ankle, R. That was awful. I shudder to think what a break would be like. I think I got off easy with a cold. I appreciate your suggestion for choice of remedy for me. Yeah, pass the bottle. I hope your ankle heals quickly! So sorry to hear you’ve been sick. Sara, too, has had the head cold from hell. In fact, she’s in the thick of it, so to speak. She is pretty much drowning in mucus! Hope you are feeling better soon! Tell Sara that I feel her congestion, Kathy. My cold is better now than it was, but it’s taking me a while to dry out. Not many women my age say that very often. Hugs back from the Apple! Somehow, you even manage to make a cold seem funny! Oh, and I sometimes get March and May mixed up, too. And I don’t have the cold excuse. Even tough it sounds like this one may linger for a while, I hope it leaves as quickly as it came so you can enjoy springtime in NYC. I will be so happy when it goes, Cathy! I also hate being that germy New Yorker. You’ll be happy (?) to hear that you are not alone. My son came down with the cold you described so well 10 days ago and since then he has shared this delightful guest with all the other members of the family! In fact, my daughter, who was still not gravely ill last Friday insisted that we fly to Florida for the weekend to visit a college she plans on attending this fall. The woman sitting next to me on the plane as I coughed and sneezed was delighted to have me as a seat mate!! (My high school senior has been mostly in bed since we got back- blaming me for getting her sick.) The school nurse told me this cold is the worst they have ever seen and that it typically lasts for two weeks. Our remedy of choice- Mucinex (recommended by our kindly wise pediatrician) which seems to help…I think. Yes- this is the worst cold I have ever had as well. Wishing you a speedy recovery!!!!! Thanks for providing the company for my misery, Dorothy. That was very thoughtful. I hope you and your daughter escape the clutches of this beast soon. Visits from Colossus the Cold are more like a reign of terror. Not that I always successfully avoid Colossus, I frequent thwart the attack by loading with Vitamin C and Zinc … well, at least it works for me much of the time. Hope you shake it soon. For some reason … probably Seinfeld … scenes like the fireplace mantle come to me as Classic NYC. Colossus’s reign of terror is continuing over here and he’s even brought in a friend, Vesuvius, who’s wreaking havoc elsewhere in my being. It’s been a memorably lousy week, Frank. 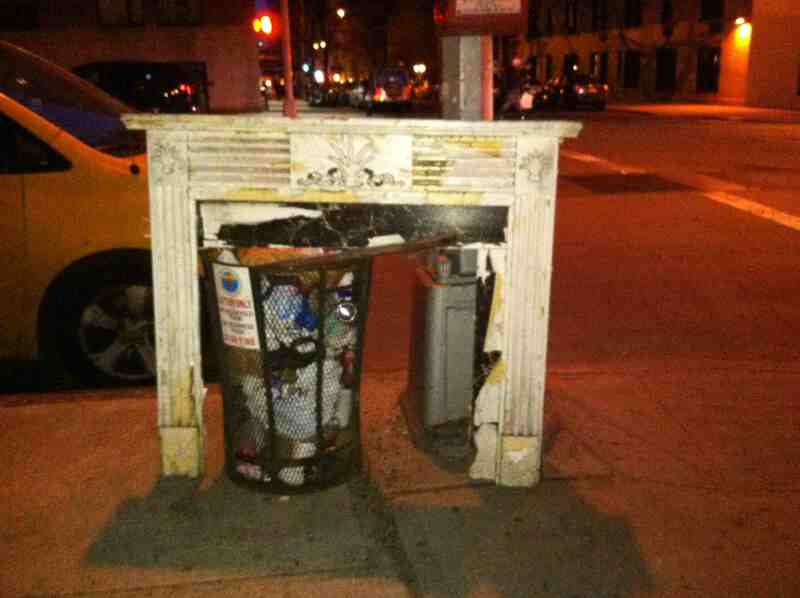 That fireplace mantle in the street struck me as very Classic NYC, too! I saw it in daylight yesterday morning when heading out to The Grind. I so wanted to take another shot of it, but I just didn’t have the energy to cross the street. That says a lot about Colossus. Oh no … Colossus sought help from the evil twin! Good luck dealing with them. The mantle reminded me of the Seinfeld episode about the armoire … and when on a NYC tour years ago, the guide said Seinfeld was not a comedy about NYC … but a documentary! Lame Adventures is proof that you can still walk on the neighborhood streets in NYC to this day, Frank, and you could still find plenty of footage to film, or at least blog about. Hooray .. .and cheers to your effort … and more importantly, your insight! PS: Tomorrow marks a return. I think I know what that means Saturday morning-wise! (You needed a break from that; you’ve covered it to an impressive degree though.) I will get over to your site today; just moving at Tai chi pace. I’m not even at The Grind today. I would suggest more sleep, but I know you are an insomniac. Then I thought about a pint of Graeter’s … oops … lactose intolerant … then a thought of limoncello came to mind … nope … we don’t won’t you in the morgue … then I ran out of ideas. I am not an insomniac! I am a night owl! But your other facts about me are spot on. Oops … me bad … I stand corrected. You need some Vitamin V—VODKA. I’ll share that remedy with vodka martini drinker, Coco, Dr. Jules. I once saw a little girl lick the subway pole. I wonder what kind of illness she contracted. Bubonic plague, perhaps. I hope her mother noticed and immediately sprayed her daughter’s tongue with Lysol. I don’t know who infected me with all these germs, but they’re flaunting their staying power. Glad you appreciated the dollop of self-promotion. Sounds like you got the cold I had. It started in December and the cough lasted into February. Boy are my abs toned up now. Look at the positive whenever possible. Like Frank, I load up on zinc at the first signs of a cold. Too late now for you. It would just give you an upset stomach. Sorry. That’s a GREAT tale about the recliner in the road, Jim! In that position and in that place it doesn’t sound like it just happened to fall off a truck. It sounds like that might have done that intentionally! I would have loved to have been there to have seen that. Loading up on anything I generally avoid because I do have a fragile stomach. I think my cold karma just ran own and it was time for me to be smacked with one that’s hurricane force. Where’s the National Guard? Here’s hoping you’ve seen the last of Colossus! I hope I’m not taking a chance on catching it by reading your blog… no, I’m probably ok. Spring may have finally made an appearance here and I hope the same goes for New York, and that you feel well enough to enjoy it! Colossus has had such staying power, Terri, I somehow missed your comment! He’s also quite a devious bugger! By all means absolutely avoid encountering him. Spring has sprung in the Big Apple, too. I hope I’ll get to enjoy it before the summer inferno arrives. Good to know that it’s showing up by you, too. Ah, so the noise I heard the other day was you, LA, and not thunder? Hehe… only joking! There’s nothing worse than having a cold, thinks I. I know, because I’m starting to come down with one as I type – I’m constantly sneezing. Hope you’re feeling much better by the time you read this! I hope you didn’t come down with the one I have right now as you read this response, Tom. Colossus is a brute! Ugh. I can certainly sympathize with you. Had a whopper of a cold last month and am now paranoid about coming in contact with more germs. I was walking down the aisle at the supermarket the other day when a woman ahead of me practically coughed up a lung. I spun around immediately and sprinted in the opposite direction. I could just see those little deadly droplets hanging in the air, waiting to dive bomb my airways. Feel better soon! When I unload this one, I will be just like you — paranoid about catching another! This one is a beast! Thanks for the well wishes. I feel your pain and sniffles and clogged head. I went through that and it lasted about a week. I took plenty of Musinex (a miracle drug in my opinion and I HATE to take pills) and sucked on those Ricola lozenges. Also green tea with ginger and lemon is kind of soothing. Hope you’re feeling better but it takes awhile to shake it. BTW, I could do wonders with that mantle, V.
I survived flu season unscathed only to get steam rolled by Colossus, Brig! It is taking me longer than I anticipated to unload this monster. After how you resurrected that bench, I can imagine the magic you would have worked on that mantle! Always great to hear from you, buddy! It’s always eye-opening (ear-opening?) when the final throes of the cold are going and you finally hear the hamster orchestra again and the world has color and your head stops weighing a ton. Glad you can still appreciate the random awesomeness of fireplace mantle placements in the midst of the muck! When my ears open, Sarah, it will be like the Heavens singing. I think my eye for random mantles in the muck is imbedded in my DNA. I;’m not complaining. Personally? I love the addition of the mantle, very cool. You named your cold? This is likely why it stuck around so long, it thought it was welcome. Next time, don’t name it. Every time you sneeze instead of achoo, do something different something that starts with F..you get the drift. I swear to you, promise don’t make them welcome give them terrible things they will leave you post haste. Alas, Val, the mantle is long gone, probably already in a landfill. The F-bomb advice is appreciated! I’m going to save a link to this blog and read it every time I get a cold from now on. CLASSIC! I hope whatever cold you get next, it’s not this beast. Valentine is right, LA. NEVER name a cold … ever! Hope you feel better soon and then remember that bit of advice forevermore. You’ll be very glad you did. I’m feeling much better now, but that cold was a beast! Glad you liked the post. I was delirious when I wrote it. You’re right about the practicality of that invention that follows fire and the wheel: pockets. I hope you have kicked the cold to the curb. It’s funny how your brain shuts down and can only produce snot. Will they let you usher in 2004? There’s a nice couch outside on our street. We should place it next to the mantle. My brain definitely took a break and I was producing supertankers of my own goo for far too long. I’m still not completely recovered, but I’m much better. Gee, we could Photoshop a complete livingroom. Feeling any better? Also, IMAX colds are overrated. Sure, there is a lot more detail to see in the sneezes and coughs, but it takes away some of the magic, too. I’m old-school when it comes to colds, I guess. I’m relieved to say I’m drying out, a statement under normal conditions I would not want to be associated with at all as this stage in my decrepitude. This cold was much more action film than silent era two reeler.